to band a few wintering birds, including this Common Redpoll. Notes: The weather remained cold for most of February, and there was also a fair bit more snow added to the already above-average amount that has fallen this winter. However, we made 6 visits to MBO over the course of the month, and on one of those occasions conditions were pleasant enough to allow us to briefly open the nets for the first time this year. That we banded a couple of Common Redpolls was no surprise, as large flocks have dominated the bird life at MBO this month, but it is surprising that we keep catching "new" Black-capped Chickadees, considering how many local birds we have already banded earlier this winter or in previous years. In addition to the four new birds, we recaptured three previously banded birds for the first time this winter. 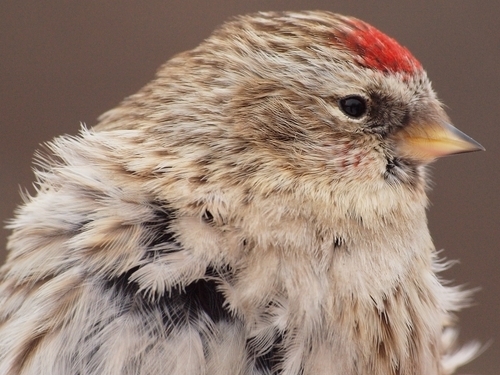 As noted above, Common Redpolls were present in large numbers throughout the month, following up on the arrival of a smaller flock we noted at the end of January. 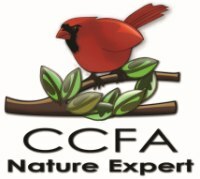 Three other species were observed on all visits this month, all of them also frequenting the feeders: Black-capped Chickadee, Northern Cardinal, and Slate-colored Junco. Of these, only the chickadee was abundant enough to crack the top five for the month, along with starlings and Bohemian Waxwings still feeding on last fall's buckthorn berries and other fruit, and part of the local crow flock. Among the redpoll flocks was at least one Hoary Redpoll, the first observed at MBO since March 2006. Four other species were observed for the first time this winter, with the least surprising of them being Ruffed Grouse, although it is far from common at MBO. Great Horned Owl and Eastern Screech-Owl are both local residents, but Greg's sightings this month were our first ever winter records - probably attributable to us rarely being around close to dusk or dawn (let alone at night) at this time of year. The crows helped out a bit by mobbing the two Great Horned Owls, while the Screech-Owl required some sharper spotting, as it perched along the census trail by the back ponds. Arguably the biggest surprise though is that this month we saw our first House Sparrow of winter ... and in fact, it was our first sighting of this formerly regular species since last winter! 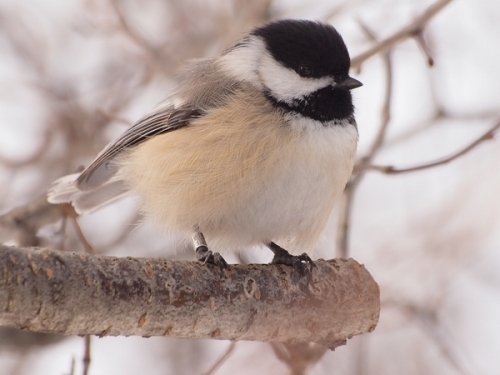 One of our banded resident chickadees hanging out near the feeders.